The great room features a fabulous two sided gas fireplace, coffered ceiling, light/fan fixture and full wall of large windows across the back of the home which flood the room with sunshine. The great room opens to a newly updated gorgeous $100,000 “Aya” eat-in gourmet kitchen with superb attention to detail including custom floor to ceiling cabinetry, soft close dovetailed drawers, massive centre island, Cambria quartz countertops, Jenn-Air Professional Series appliance package, and access to the rear yard. The main level also includes a separate dining room with two sided gas fireplace and five point chandelier connected to the living room/den by a butler's pantry with granite countertop. The generous sized mudroom with custom cubbies and cabinetry, access to two car garage, and two piece powder room complete the main floor. The splendour continues on the second level with an open landing, spacious master bedroom featuring an open walk-in closet with California closet custom built-ins. Wake up in the morning and enjoy the view from the large windows overlooking the park and soak in the warmth from the electric fireplace. The sumptuous Master ensuite features His & Hers caesarstone vanity sinks, standalone soaker tub, and glass shower with tile surround. The second bedroom features a double door reach-in closet and ensuite access to the three piece main bath. The remaining two bedrooms are both generous in size with ensuite access to a three piece bath. The spacious family room/den with built-ins and sliding door access to a large glass enclosed deck and laundry completes the second floor. 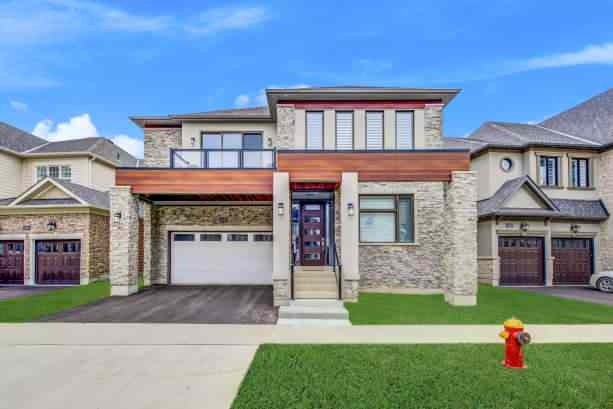 Located in one of Oakville’s most sought after neighbourhoods, within easy walking distance to schools, parks, transit and shopping.